A roughly circular cairn of 51-54 feet in diameter adorns the top of Cefn Gelligaer. A damaged burial cist is in the centre of the cairn beneath a modern OS triangulation pillar. Records from the 18th and 19th centuries mention 3 parallel cists containing cremated remains and pottery urns, but there is no evidence of this today. Gelligaer Common is home to a wealth of prehistoric sites, including the Gelligaer standing stone. At the summit of Cefn Gelligaer is the largest of these monuments, a Bronze Age round cairn. The cairn is almost completely circular, about 54 feet diameter, with a kerb of large stones laid flat. The kerb stones are quite small; roughly 10-11 inches high. There are larger slabs, some overlapping, on top of the cairn. At the centre is a badly damaged burial cist. It must have been lined with stone slabs on all sides, but only one small slab remains, on the west side of the cist. The cist was covered by a cover stone, roughly oval in shape and over 6 feet long. This has now been displaced, revealing the cist. Written records suggest that the cairn was opened in 1700, and burnt bones and cremation urns were found. In 1875 a series of 3 parallel rectangular cists were mentioned, but there is no sign of these today. In fact, the most obvious thing to see is the modern concrete OS trig marker which intrudes into the cairn. There are several Bronze Age round cairns to the north and south. The Roman road of Sarn Helen runs nearby, and just a few hundred yards down the hill is the Gelligaer standing stone, leaning at an acute angle but somehow still upright! 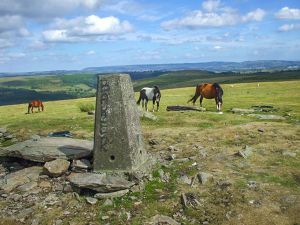 The cairn stands on the summit of the hill, reached by several footpaths. One starts beside the burial ground at Pentwyn, to the north, and another from the Parc Cwm Darran visitor centre north west of Bargoed at SO113034.